The organizers of the Paralympic torch relay have promised to put on real shows in each of the 45 cities to be visited by the flame. The Sochi Games have already become history, but the victories from the games continue: Russia’s Olympic capital will host the Paralympic Games from March 7, following the completion of the Paralympic Torch Relay, which began on Wednesday, February 26. The torch’s journey, which will be held under the motto “Fighting. Winning. Inspiring,” began at Cape Dezhnev – the easternmost point of Russia. The flame was ignited in Chukotka, which is the first place in Russia to meet the dawn, at 5:10 am local time with the help of a bright pyrotechnic show. At the time it was still February 25 in Moscow. Mikhail Terentyev, General Secretary of the Russian Paralympic Committee, said that 1,500 people, most of whom have disabilities, will carry the flame through 45 Russian cities. Every day the torch will be lit in several cities, and the relay will finish at the Fisht Stadium in Sochi on the opening day of the Paralympics on March 7. Organizers have promised to arrange a unique show in each city. In Nizhny Novgorod on the Volga, the torch will be lit using photochemical synthesis. A no less interesting method will be tested in Volgograd: Archimedes’ famous experiment in getting fire from the sun using a system of mirrors will be recreated in the city’s planetarium on March 4. In the Siberian city of Kemerovo, a symbolic blast furnace will be built specifically for the relay to “smelt” the flame. Meanwhile, in southern Krasnodar, a theatrical performance will be arranged in its Cossack ethnographic village: a blacksmith will strike a spark with a blow of the hammer on the anvil, igniting the Paralympic flame. In the Arctic, the Paralympic flame will be lit by the “Northern Lights” in Murmansk. There will be an air show in the Moscow Region. The aviation group “Russian Knights” will perform aerobatic stunts and will trace the symbol of the Paralympic Games in the sky. One of the stages will be held in the British town of Stoke Mandeville, in the county of Buckinghamshire, which is considered the birthplace of the Paralympic Games. The competitions that were held here in 1948 were a forerunner of the first Paralympic Games, held in Rome in 1960. Starting from 2014, this stage will be a mandatory part of all Paralympic torch relays. 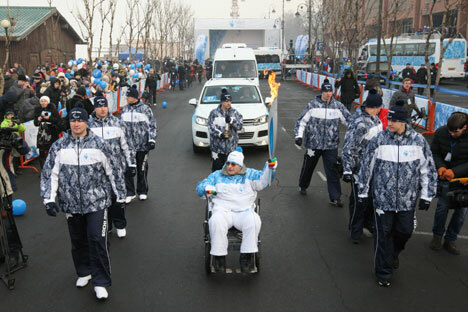 The torch of the Sochi 2014 Paralympics will be carried by Mikhail Terentyev, Paralympic champion and current General Secretary of the Russian Paralympic Committee. “We won 38 medals in Vancouver – 12 gold, 16 silver and 10 bronze,” noted Terentyev, who vowed that the Russian team would strive to achieve this figure or even surpass it. “I hope spectators will get the same emotions from the performance of Paralympic athletes as from the Sochi Olympic Games,” he said.